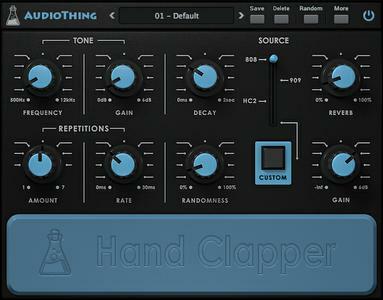 Hand Clapper is a drum synthesizer dedicated to claps sounds. The internal design is inspired by a famous Japanese percussion synthesiser from the '80. There are three internal noise sources that are used to recreate the classic sound of vintage analog drum machines (such as 808, 909, HC2, and more). Thanks to a simple set of adjustable parameters, Hand Clapper allows for extensive shaping of both it's own sounds and any custom samples you care to load in.